Today on The Rap Sheet there was a mention of a new cookbook: Cooking with Columbo: Suppers with the Shambling Sleuth by Jenny Hammerton. Of course I ordered it, and I can't wait to read it! I have an extensive collection of tie-in mystery cookbooks, focusing mainly on mystery and literary cookbooks, but also art and music, tv shows, movies, and the like. I posted the following article about Killer Cookbooks in 2010, so it's time for a repost. I will definitely review Cooking with Columbo when I receive it, but in the meantime I thought my readers might enjoy this updated post. I have a passion for collecting ‘things’-- books, to be sure, patriotic Americana embroideries, rugs, American folk art, and the occasional cat and dog. I love flea markets and garage sales, and the occasional dumpster. Don’t leave something by the road, because I’m bound to find it. Besides the 18,000 mysteries I have collected that are stored both here and in Bodega Bay…yes, that Bodega Bay-- no birds in the belfry, as far as I know, but not sure about the garage where many of my books are stored-- I have a passion for food and the written word. Mystery Readers Journal has had six issues devoted to Culinary Crime. The last two issues on the subject were divided into courses. Each contributing author who wrote an Author! Author! essay, also included a recipe. Over the years of moderating my weekly mystery book group, I have assigned five 10-week sessions on food mysteries (culinary crime). In two of the sessions I led, I prepared the ‘suspect’ food in the book for our dining pleasure…sans poison, of course. This was over 20 years ago, and it was quite unique for its time. 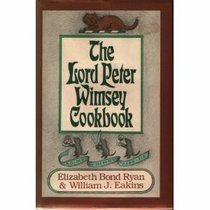 I also set up a Lord Peter Wimsey dinner at a local restaurant where everything was prepared from the recipes in the Lord Peter Wimsey Cookbook. Harriet Vane appeared half way through the dinner! Very exciting! I was able to arrange this since I write and produce mystery events. My company’s name? Murder on the Menu®! I also set up a Nero Wolfe Dinner. Everyone came in costume, and I wore Yellow Silk Pajamas. Perhaps my love of orchids came from the Nero Wolfe books? But that’s ‘another’ collection. And this leads me to one of my favorite collections: Literary Cookbooks, books that tie in with famous mysteries, writers, detectives, TV shows, art, and movies. I've been collecting Themed Cookbooks for years. For purposes of this post, I’m confining the list to my mystery cookbooks. This list of titles is in no particular order and certainly not definitive. I have over 150 mystery themed cookbooks. My complete Tie-In Cookbook Collection is over 700 and extends to cookbooks such as Linda Wolfe's The Literary Gourmet which I've bought at least three times -- it's always so intriguing at the used bookstores that I forget I already have multiple copies, The George Bernard Shaw Vegetarian Cookbook, The Pooh Cookbook, Miss Piggy's Cookbook, Dining with Proust, Blondie's Cookbook, The Cross Creek Cookery, The Rock & Roll Cookbook, and many, many more. The Lord Peter Wimsey Cookbook by Elizabeth Bond Ryan & William J. Eakins (Ticknor & Fields,1981). This is a classic and a must-have for any fan of Dorothy L. Sayers. Cooking with Malice Domestic, edited by Jean McMillen & Ron McMillen (Mystery Bookshop Bethesda, 1991). I bought this book at Malice the year it came out, and it's filled with great recipes by authors and fans of the malice domestic subgenre. I attended the first Malice Domestic conference, and this year I received the Poirot Award. I was very honored. Sneaky Pie's Cookbook for Mystery Lovers by Sneaky Pie Brown co-written by Rita Mae Brown (Bantam, 1999). I envy Rita Mae Brown having a cat who not only cooks but also writes about it! My cats are much more stereotypical and depend on me to prepare and serve their food. The Murder She Wrote Cookbook, edited by Tom Culver and Nancy Goodman Iland (Chicago Review Press, 1996). This is a compilation of recipes from the cast and crew. The Cop Cookbook: Arresting Recipes from the World's Favorite Cops, Good Guys and Private Eyes, by Greta Garner-Hewitt, Ken Beck and Jim Clark, with foreword by Robert Stack (Rutledge Hill Press, 1977). TV, movie and real cops contribute to this cookbook with great archival photos of CHiPS, various Femmes Fatales and more. Take a ride down memory lane. Cooking to Kill: The Poison Cook-book, concocted by Prof. Ebenezer Murgatroyd with Comic Drawings by Herb Roth (Peter Pauper Press 1951). A cookbook to "end" all cooks. Very funny humorous collection of deadly recipes with great illustrations. The Nero Wolfe Cookbook by Rex Stout and the Editors of Viking Press (Viking 1973). This is another of my favorites. Any collection would be incomplete without recipes prepared by Fritz Brenner, Wolfe's world-class personal chef. 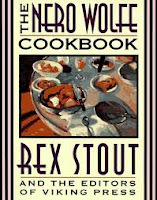 Too Many Cooks is my favorite of the food Nero Wolfe mysteries, and this cookbook contains several recipes from that novel. The photographs in this cookbook alone are worth the price. There are 44 museum-quality images of New York in the '30s, '40s, and '50s -- very art deco. The Kitchen Book by Nicolas Freeling (David Godine, 1970) and The Cookbook by Nicolas Freeling (David Godin, 1972). Wonderful cookbooks filled with great recipes encapsulated within cooking text. If you are a fan of Freeling as I am, you'll want to have these two books in your collection to read on a cold winter's day. The Cat Who Cookbook by Julie Murphy & Sally Abney Stempinski with a special note from the late Lilian Jackson Braun (Berkeley Prime Crime, 2000). Recipes from the Cat Who series. Koko and Yum Yum are not the cooks. Perhaps Qwilleran will become inspired. Includes a special section on feline fare. Food To Die For by Patricia Cornwell and Marlene Brown (G.P. 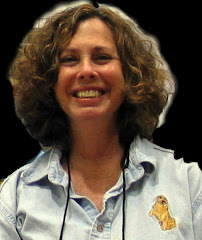 Putnam, 2001). Secrets from Kay Scarpetta's Kitchen. We know that Kay loves to cook and this clever cookbook with glossy color illustrations capitalizes on just that. Roald Dahl's Revolting Recipes, illustrated by Quentin Blake (Puffin Books, 1994). Unfortunately no Lamb Recipe. Although a kid's cookbook, I had to include this as Roald Dahl is a master storyteller. Recipes from Charlie and the Chocolate Factory, James and the Giant Peach and more. Dishes to Die For... A Compendium of Culinary Concoctions Collected from Canadian Crime Writers (Crime Writers of Canada, 1996). Novel format with suspect statements, backgrounds and previous record. The Nancy Drew Cookbook: Clues to Good Cooking by Carolyn Keene (Grosset & Dunlap, 1973). Reads like Nancy Drew. How can you become a really good cook? "It's no mystery, " Nancy Drew reveals. "You must do what fine cooks have always done -- add your own special touch." Cauldron Cookery: An Authentic Guide for Coven Connoisseurs by Marcello Truzzi, illustrated by Victoria Chess (Meredith Press, 1969). Must be initiated into a coven in order to procure ingredients such as eye of newt. Murder on the Menu: Food and Drink in the English Mystery Novel by Jeanine Larmoth, with recipes by Charlotte Turgeon (Scribner's, 1972). This is a true classic and one to snap up when you find it at a garage sale, used bookstore or online. Includes a wonderful analysis of the genre, citing authors such as Dorothy L. Sayers, Agatha Christie and more, with 160 recipes ranging from potted shrimp to gooseberry fool. Desserticide, aka Desserts Worth Dying For, edited by Claire Carmichael, Paulette Mouchet and Mary Jerrill (Sisters in Crime, Los Angeles Chapter, 1995). Who doesn't like a dessert cookbook? And Sisters in Crime Los Angeles put together a mouthwatering collection of recipes from Swift Dispatch Cake to Layer Me in the Grave Cookies to In for the Kill Tiramisu. Unfortunately individual recipes are not attributed. Fun, interwoven writings about oleander and other deadly ways to die. The Lucretia Borgia Cookbook: Favorite Recipes of Infamous People by Dorothy and Martin Blinder (Price/Sloan/Stern, 1971). A small volume originally priced at $1.95. Nothing particularly new to shed on Lucretia Borgia but it found its way into my collection based on title. A Taste of Murder: Diabolically Delicious Recipes from Contemporary Mystery Writers by Jo Grossman and Robert Weibezahl (Dell, 1999) including Lillian Jackson Braun, Harlan Coben, Sue Grafton, Tony Hillerman and dozens more. Great recipes and mystery writer anecdotes. 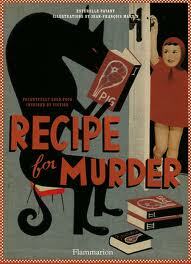 This is a great cookbook for any and every mystery reader. Just about every contemporary mystery writer at the time it was published contributed to this cookbook and its successor, A Second Helping of Murder: More Diabolically Delicious Recipes from Contemporary Mystery Writers. I have a ‘Flourless Chocolate Cake to Die For” recipe in this 2nd volume. Madame Maigret's Recipes presented by Robert J. Courtine with a Letter-Preface by Georges Simenon (Harcourt Brace Jovanich, 1974). As we all know, Madame Maigret was an excellent cook and Simenon's Inspector Maigret enjoyed her cooking for many years. This is a classical French cookbook. Delicious. Sherlock Holmes Cookbook by Sean Wright and John Farrell (Bramell House, 1976). One of several Sherlock Holmes cookbooks with typical English fare. Cooking with the Bad Guys: Recipes from the World's Most Notorious Kitchens by Don Abel (Overlook Press, 1995). Where else would you find recipes fit for Al Capone, Marie Antoinette, Jack the Ripper and Rasputin? 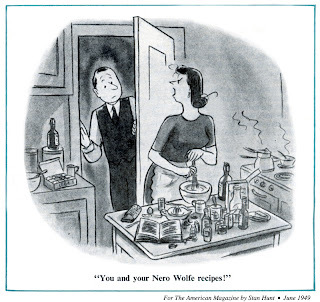 Plots & Pans: Recipes and Antidotes from The Mystery Writers of America, edited by Nancy & Jean Francis Webb, illustrated by Gahan Wilson, introduction by Isaac Asimov (Wynwood Press: Mystery Writers of America, 1989). One of my all-time favorites with terrific illustrations by Gahan Wilson. Subtitled: Hundreds of Delicious recipes from the Most Imaginative Writers in America -- Spiced with their Wit, Leavened with their Malice, and Served with their Own Distinctive Style. Oh yes! Où Est Le Garlic: French Cooking in 50 Lessons by Len Deighton (Harper & Row, 1965). Len Deighton, like Nicholas Freeling, was a chef and this book shows it. Wonderful "cookstrips" (hand-drawn illustrations) bring the recipes to life. Writers' Favorite Recipes compiled by Gillian Vincent and the National Book League of Great Britain (St. Martin's: 1979). Recipes by Len Deighton, Edward Gorey, Graham Greene and others. Breezy anecdotes as well as recipes. The Gun Club Cookbook by Charles Browne (Scribner's, 1930). Not a mystery cookbook, really, but wonderful illustrations and a great period piece. The Sopranos Family Cookbook as compiled by Artie Bucco by Allen Rucker (Warner Books, 2002). Yes, “family” recipes..
Brunetti’s Cookbook: Recipes by Roberta Pianaro with Culinary Stories by Donna Leon (Atlantic Monthly Press, 2010), with anecdotes, recipes and beautifully drawn illustrations! There are also excerpts from the novels and original essays by Donna Leon on food and life in Venice, the perfect addition to this wonderful cookbook. I reviewed this cookbook on both DyingforChocolate.com and Mystery Fanfare. Recipe for Murder: Frightfully Good Food Inspired by Fiction by Esterelle Pavany, Illustrations by Jean-Francois Martin. One of my most recent acquisitions, and a must for Mystery Cookbook Collectors. I still need to review this cookbook. Hannibal’s Express Sweetbreads should give you an idea about the type of recipes! Illustrations are marvelous. Reading these cookbooks can be as intriguing as reading a mystery.